The Payment Card Industry Data Security Standard (PCI DSS) is a set of requirements created collaboratively by global credit card companies to ensure that all companies processing, storing or transmitting credit-card information maintain a secure environment. Do you need PCI DSS compliance? If you send faxes that include full credit card numbers (referred to as "payment card data" by PCI) you need to comply with PCI DSS. InterFAX has maintained compliance with PCI DSS for several years as a merchant, and stays up to date with changes as it evolves. 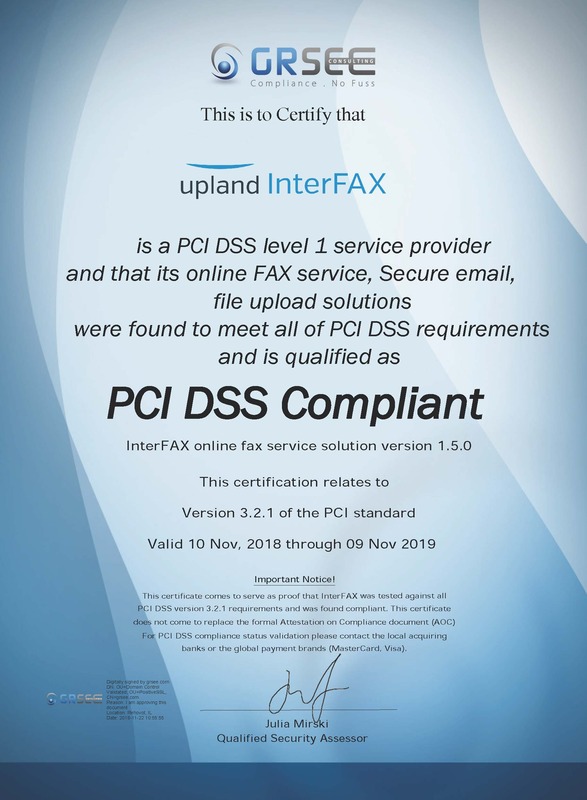 Our commitment to the standard directly led to the development of PCI Fax – a premium security service offering you the highest level of client data protection - PCI Tier 1 certification. This protection enables PCI compliant fax transmission and PCI compliant fax reception. How is this different from regular faxing through InterFAX? With our standard service, InterFAX acts as a passive conduit for fax content passing through our systems. We improve fax security via our TLS and PKI inputs and our popular "Delete Fax after Completion"' feature, which ensures that fax images are not stored on our systems any longer than necessary for faxing. With InterFAX PCI Fax, your faxes are sent through a separate, hardened subsystem, which has undergone rigorous compliance testing. This means that you remain PCI DSS-compliant when outsourcing your faxing to InterFAX. Already addressing HIPAA requirements in the US and compliant with the Privacy Mark in Japan, and with plans to meet EU, Australian and other privacy standards, InterFAX has made global privacy and security regulations a strategic priority. Contact Us to discuss the InterFAX PCI Fax and how it applies to your faxing.